I have read and seen several videos on how sand filters work better as they start to capture materials. The idea is that the filter will capture finer material as the coarser pathways start to get filled. One video suggested that pressure should not be the determining factor to backwash the filter, and that the flow should be the determining factor. He also stated that people will call him and say that their sand filter is not working and his advice is to quit backwashing so much and let the filter run for longer periods. Well, I took that advice. I checked the flow every day and it seemed good. The input skimmer was working well and the output jet seemed like it was putting out a good amount of water. Today (5/16), it seemed a little slow so I decided to backwash. The last time I backwashed was 5/10. The backwash flow started good and then nearly stopped. I switched to rince, ran it for a few seconds, then to backwash. Same thing. The flow was very low and the filter head pressure was very high. Also significant amount of sand also came out during the second backwash. 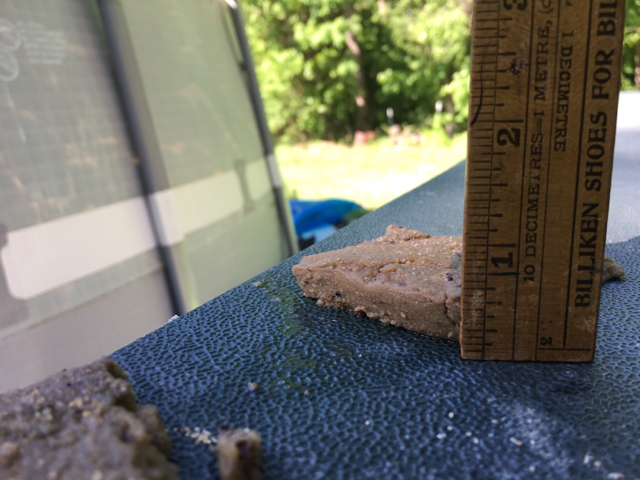 I opened the sand canister and found a compact layer of material about 1/2" to 3/4" thick on top of the sand. It had broken up a little from the backwashing, but for the most part it was still solid. It had the constancy of wet cardboard. I suspect that it was tree pollen. We are surrounded by 100's of oak trees and around this time of year everything gets coated with it. So, lesson learned. Maybe this time of year is not a good time to wait so long between backwashings. Or maybe I took some bad advice. No harm no foul. Lost a little bit of sand, but I have more. I have an aerator port on my pool that I leave on all year but at a very low flow rate. It squirts up and out about 8". With just a glance, I can tell if the flow through the filter has fallen significantly by looking at the reduced arc of the water spray. When the spray is reduced too much, I do a backwash. Interesting. When was the last time your filter was deep-cleaned? Is it possible that remnants of floc or other agents have been building in the filter? I would think that if sand filters couldn't handle pollen that cartridge and DE filters would be even worse and pool owners throughout the globe would live in fear of trees! Have you ever added DE? I'm a fan. A little goes a long way (and it's not expensive in the first place). It puts us in control of the "granularity" of sand filters instead of waiting for dirt/debris build-up. The sand filter is brand new. I backwashed at the end of September. I have not backwashed since then and will probably not backwash until September again. Personally, I use socks to pick up debris before it gets to the filter. My pool is in ground. I personally recommend not backwashing unless the pressure rises 25% to 30% from normal starting pressure. My water is so crystal clear, that people think that something special is going on, when in reality it is the filter and the TFP method. Then again, most people who really do not understand backwash every time they vacuum, which is not a good thing. If you have good flow back to the pool and the pressure has not risen, then no need to backwash. What about what might be in your water...? I like the idea of the socks. Where do you put them and where do you get them? I'm looking for an explanation of why something/pollen clogged your filter with the wet cardboard-like substance. Floc would be an example. Ah... Good question. I added 2 oz of Floc on 4/25. Backwashed on 4/26, 4/30, 5/10 and today 5/16. The pool has been clear since about 4/28. Nothing else except 10% chlorine and 1 lb of CYA. Free chlorine has been around 5 except for the last few days it has been low and and untested. Water has stayed clear. Or it could be a new food. Soilent Brown. Some of the guys use hair net type of socks, which work well. I can not find the location, but remember them being on amazon as well. The regular socks, although more expensive capture a lot of debris before it gets to the filter. These are the other type you can purchase on Amazon. Thanks Catanzaro. I will definitely give those a try. Did you vacuum to waste when you used the floc? It should not have ended up in your filter because it can really mess it up. Did you get it all out of the filter while you had it open? I didn't have any "fall out" from the Floc. But I did vacuum to waste initially. I really didn't see any improvement after using the Floc either. It was cloudy and slowly cleared over time. I expected a radical change in clarity but didn't see it.